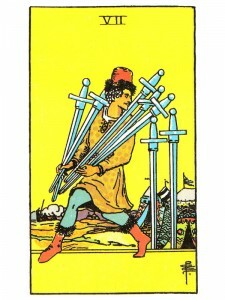 Seven of Swords says stabilize your mind. Your belief system is your natural grounding – your mental foundation from which you can take great leaps of consciousness, then return to regroup and renew. You have wit and cunning, the ability to create plans and strategies. When the odds seem to be against you – seek a way to disarm the enemy. You have the ability to take the potential “sting” out of any situation by forethought and preparation – using your ability to take care of details. Do something daring that proves your bravery, skill, speed and cunning. If it looks like things may not work out the way you have planned them – have an alternate way to go. Apply your mental energy to every task and prepare your ground for later action. You are perfecting your wisdom, gaining maturity as you learn to control your power, emotions and intuition. If you find yourself unable to get anyone’s help – ask yourself if you are perhaps “hiding” your true plans and intentions? Seek “inner” guidance and the solutions will be presented. You have begun to include others as extensions of the self. Here the higher physical aspect of mind, its dedication and application in the hard realities of the world, but with the goal of proving to itself the existence of God in everything, to rationalize faith through the actual experience of divinity in the physical world. This is a time for mental harvesting, for analysis/measuring of progress in preparation for the next round of thought, decision and action. A bit of a perfectionist. Here is the informed, the qualified, the certified, the approved, the accepted. Education, particularly advanced education, schooling with a definite purpose. Investigation and research – observation and recording. Speaking out, advancing your opinions. Physically carrying out mental projects. Materializing ideas into mechanics. Moving information. News, Communication, publishing, writing, editing, computers, storage of information. Next to Fool: You are too changeable and inconsistent, try to be more positive. Next to Nine of Cups: You will receive what you want, but not necessarily in the way you want it. In the first position: The mind is enlisted in the highest uses of intellect, in learning and communicating the lessons which transform the lowly ego into the higher self which is identifying with the world/universe. This is the procession of self to Self. In the second position: The information, the knowledge you hold in store, is your greatest asset and much of it goes with you wherever you go. If all else were stripped from you – you could rebuild from this kernel. In the third position: Better clean out those files, it is mental moving day. Save only what is necessary for a valid reference for future projects. Also, purge the memory of unneeded trivia. Review procedures, study/work habits. The mind has serious work to do. In the fourth position: Here is the passion of the intellectual, the love of books, of study and knowledge and in contemporary times the computer whiz with an enormous appetite for information. In the fifth position: The mental plane shifts gears. Plans now involve hard data, depth of evaluation. You are stepping forward with your agenda. While speaking out is always a feature of the higher swords, this feels more like speech writing than speech making. In the sixth position: As the mind seeks higher and higher truth, all that has gone before must pass through these new tests, this new gate of authenticity. What was once satisfactory at a lower level may no longer suffice. But everything that was part of our true path will pass through the gate leading to the inner courtyard. In the seventh position: Here the passion for knowledge and the passion for truth should be one and the same in order to progress rapidly and safely. You will accept the challenge of your intellect. In the eighth position: Here are the physical/material ramifications of your mental harvest and new planting season to come. New work or relocation may be in the offing to accommodate this major shift. In the ninth position: The heart gives thanks for what the mind has accomplished, yet yearns for a new cycle of learning and mental involvement. It is hungry for the environment of the inner courtyard leading to the garden of Eden, where the fragrance of wisdom fills the air and stirs the senses with an almost unbearable sweetness. In the tenth position: This is a time for validation, for you must build now on what you believe to be the truth, as you must now work to contribute to the truth. As you increase your ability to focus and you see in minute detail the wonders around you, your mind will easily support the projects your heart is pulling you towards.